¡Lo hicimos! Hooray! We finally did it. I signed my daughter up for Spanish immersion classes. I can't believe it's taken me this long. But now that she's three and a half I think that adding a third language to her repertoire will really be a boon for her college applications. And the amazing part is that it's ONLINE. I only pay $9.95 per month and we have 24 hour access to our incredible profesora. So we don't even have to leave the house. Or even get dressed in the morning! The instructor's name is Dora and she is super energetic and really connects with the kids. I can already see a vast improvement in my daughter's Spanish language skills. They use a lot of repetition exercises in class and Dora is always engaging them in fun interactive adventures. The assistant teacher isn't always on task and is sometimes even a little distracting, probably because he's a purple monkey, but otherwise I couldn't be happier. 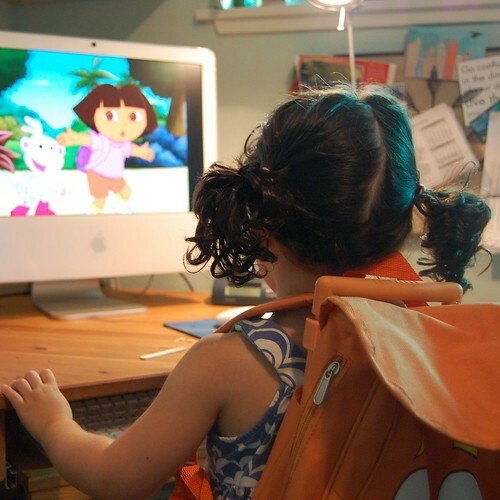 We're thinking of contacting Dora to hire her as our online Au Pair. As long as the kids stay in front of the computer we feel like they'll be in really capable manos.